The Ausled and Kloval Swedish Vallhunds welcome one and all! This website is designed to offer our viewers all the information on the Swedish Vallhund. It will be updated daily and new sections and information will be added regularly. This website is to introduce you to the Swedish Vallhund, a delightful breed of Spitz origin. These little dogs are powerful, strongly built, very active working dogs that are intelligent, very inquisitive and trustworthy with children and other animals. They do well in obedience, agility and tracking and are equally at home in town or country. They are as a rule very healthy and long lived and make good companions. They vary in color from red through cream to wolf grey and sable with attractive face mask and harness markings. Their coat is short and needs minimal care. They have a natural or docked bobtail and a free and active gait. Swedish Vallhunds originate from Sweden where they are variously known as Vastgotaspet (Spitz of the West Goths), Vastgota Spitz, Vikingarnas Dog, Swensk Vallhund (Swedish Herding Dog) and ‘little bob-tailed farm dogs”. When the breed was introduced to England in 1974, the name Vastgotaspet was considered too difficult for the average English pet owner so the breed became known as the Swedish Vallhund. The Swedish Vallhund is a herding dog that has been used for centuries as a drover of cattle in Sweden. 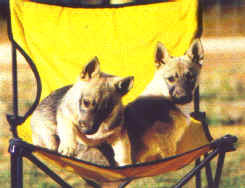 The Vallhunds were used on farms on the Vastergotland plains of southern Sweden not only for cattle herding but also as vermin catchers, watchdogs, and general supervision of all the operations of the farm.